In their continuing effort to promote safety and enforce sound and alcohol laws, Michigan Department of Natural Resources conservation officers conducted group snowmobile patrols recently in Houghton and Ontonagon counties. On Jan. 11, conservation officers began their weekend group patrols along the state-managed trail system in Houghton. The DNR and several partners have mounted a “Ride Right” snowmobile safety campaign this winter. Riders are being reminded to ride on the right side of the trail, at a safe speed and sober. Snowmobilers are also being asked to anticipate and yield to trail groomers. “We want everyone to ride safely so they can make it home to their families and friends,” said Ron Yesney, DNR U.P. trails coordinator. On Jan. 12, conservation officers continued their group snowmobile patrol in Bergland, addressing sound violations and riders operating while intoxicated. Again, more than 200 snowmobilers were contacted by conservation officers. DNR safety and enforcement patrols will continue throughout the winter. To find out more about snowmobiling in Michigan, visit Michigan.gov/Snowmobiling. Learn more about Michigan conservation officers at Michigan.gov/ConservationOfficers. The Michigan Department of Natural Resources is committed to the conservation, protection, management, use and enjoyment of the state's natural and cultural resources for current and future generations. For more information, go to Michigan.gov/DNR. An accompanying photo is available below for download. A suggested caption follows. Credit: Michigan Department of Natural Resources. 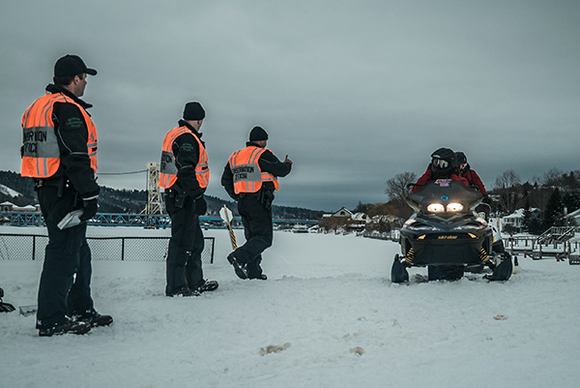 Patrol: Michigan Department of Natural Resources conservation officers team up with local police for a snowmobile sound patrol in Houghton in February 2017. Safety and enforcement patrols are conducted each winter.